Buy charity chickens this holiday season and we'll match your gift! 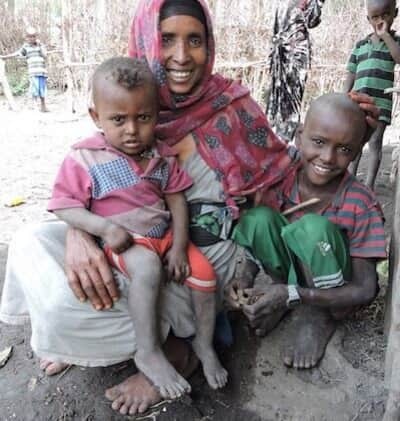 For just $25 you can give two families in Africa the chance of a brighter future. When you buy charity chickens the recipient receives three chickens which doesn't take long to turn into a secure supply of eggs and a rich source of protein. While gender equality training is an important part of our programs, many women in sub-saharan Africa are still prevented from owning land. Fortunately, chickens take up little space so when you buy charity chickens you're giving a mom financial independence and the chance to lift her family out of poverty. 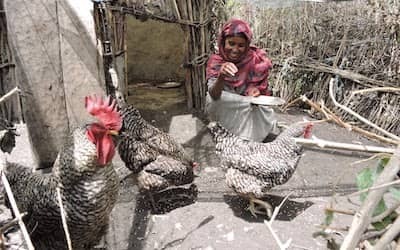 For just $25 you’ll be buying three chickens (6 with the match) that produce about 1,000 eggs each year allowing families to sell or trade the surplus for other food products. The chickens you purchase will be sourced locally, i.e. as close to the recipient as possible. This approach provides an extra boost to local economies while keeping transport costs to a minimum. Charity chickens come with a FREE Printed, PDF or eCard, perfect for sending to a special somebody. 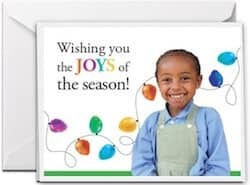 Card designs include holiday (pictured), chicken-themed, birthday, teacher, wedding plus many more. You can also buy chickens without selecting a card. How can I pay for the charity chickens? You can purchase chickens online using Visa, MasterCard, American Express or PayPal. You can also buy charity chickens by calling 1-800-387-1221 between 9am – 5pm EST, Monday to Friday. How does buying charity chickens help children? When I buy charity chickens will I receive a tax receipt? Your purchase of chickens is considered a donation to Canadian Feed The Children, so no taxes are charged.